Benjamin J. Muller, Department of Political Science, recently published the book Rethinking Hizballah: Legitimacy, Authority, Violence with Samer N. Abboud. 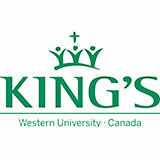 The book has been nominated for the Canadian Political Science Association (CPSA) Book Prize in International Relations for 2013 (to be decided for the CPSA annual meeting at the University of Victoria in June). 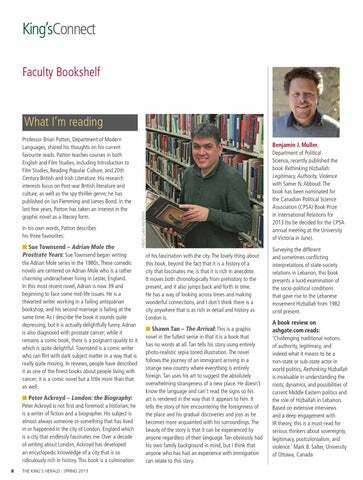 Professor Brian Patton, Department of Modern Languages, shared his thoughts on his current favourite reads. Patton teaches courses in both English and Film Studies, including Introduction to Film Studies, Reading Popular Culture, and 20th Century British and Irish Literature. His research interests focus on Post-war British literature and culture, as well as the spy thriller genre; he has published on Ian Flemming and James Bond. In the last few years, Patton has taken an interest in the graphic novel as a literary form. of his fascination with the city. The lovely thing about this book, beyond the fact that it is a history of a city that fascinates me, is that it is rich in anecdote. It moves both chronologically from prehistory to the present, and it also jumps back and forth in time. He has a way of looking across times and making wonderful connections, and I don’t think there is a city anywhere that is as rich in detail and history as London is. n Shawn Tan – The Arrival: This is a graphic novel in the fullest sense in that it is a book that has no words at all. Tan tells his story using entirely photo-realistic sepia toned illustration. The novel follows the journey of an immigrant arriving in a strange new country where everything is entirely foreign. Tan uses his art to suggest the absolutely overwhelming strangeness of a new place. He doesn’t know the language and can’t read the signs so his art is rendered in the way that it appears to him. It tells the story of him encountering the foreignness of the place and his gradual discoveries and joys as he becomes more acquainted with his surroundings. The beauty of the story is that it can be experienced by anyone regardless of their language. Tan obviously had his own family background in mind, but I think that anyone who has had an experience with immigration can relate to this story.